Ridges are scroll bars that have been incorporated into the floodplain. 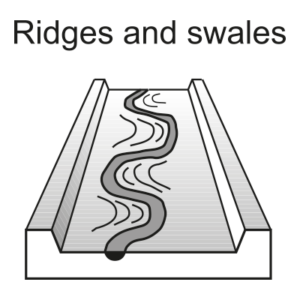 Swales are the intervening low flow channels. These arcuate forms have differing radii of curvature, reflecting the pathway of lateral accretion. Ridge and swale topography may indicate phases of palaeo-migration paths, palaeo-curvature, and palaeo-widths of channel bends. During bankfull conditions the high velocity filament is located along the concave bank of a bend. Helicoidal flow erodes the concave bank of the bend and transfers sediments to the point bar. Eddy flow cells occur in a separation zone along the convex bank. A shear zone between these secondary flow circulation patterns pushes sediments up the point bar face to form a ridge (or scroll bar). At bankfull stage this scroll bar accretes vertically. As the channel shifts laterally, the scroll bar becomes incorporated into the floodplain forming ridge and swale topography. Subsequent overbank deposits smooth out the floodplain surface and the former channel position is retained on the inside of the bend.